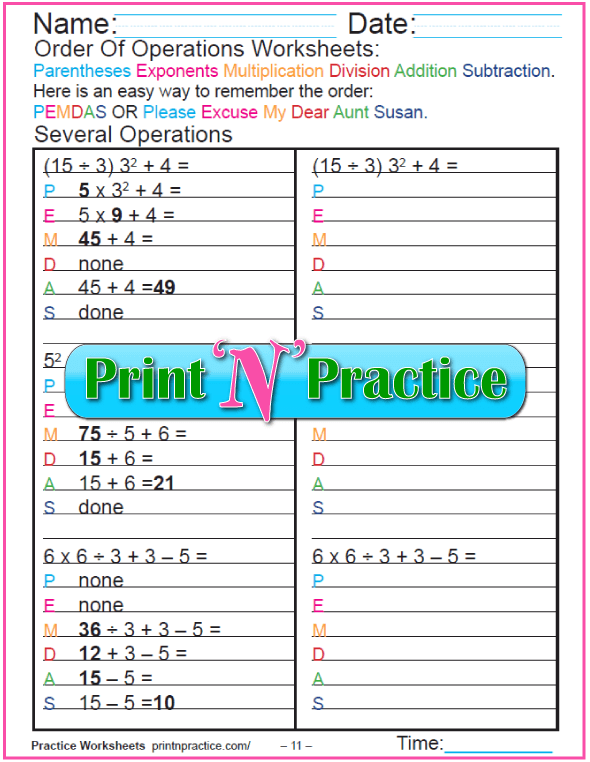 These order of operations worksheets teach the way to figure equations in the correct order, step by step like shown in the Saxon Math books. "Please excuse my dear Aunt Sara." or use the phrase PEMDAS for solving what is in the Parentheses first, the Exponents next, Multiplication and Division, and finally Addition and Subtraction - all from left to right. 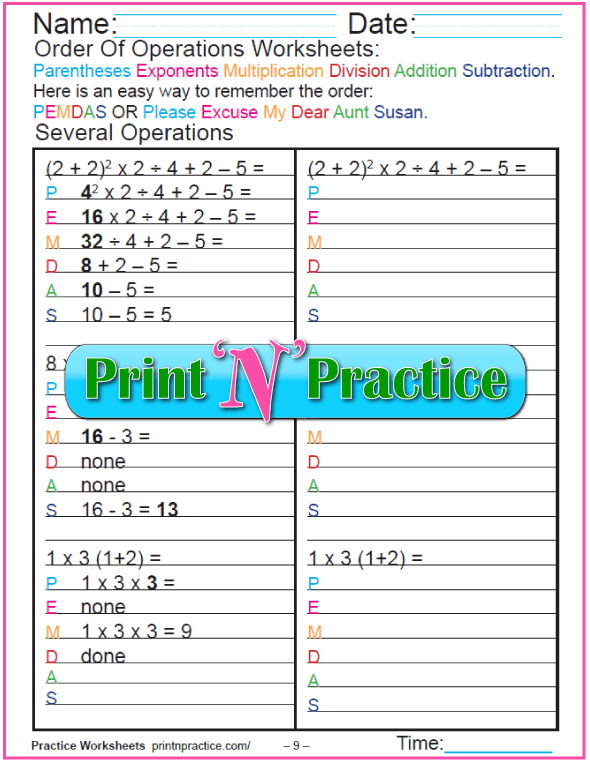 Exponents come second in the order of operations for Pre-Algebra. Use this phrase to remember the order: "Please excuse my dear Aunt Sara." or use the phrase PEMDAS. 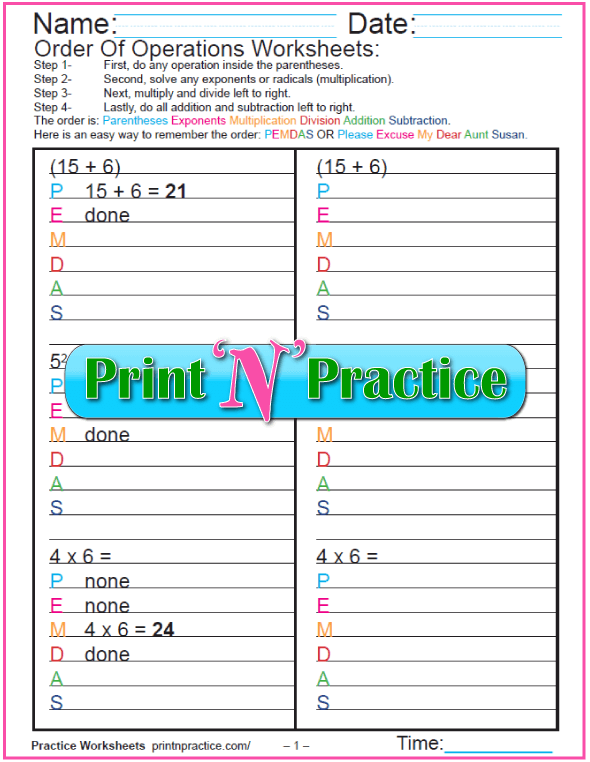 Parenthesis, exponents, multiplication, division, addition, and subtraction; but remember that in the real world multiplication and division are of equal priority as are addition and subtraction. 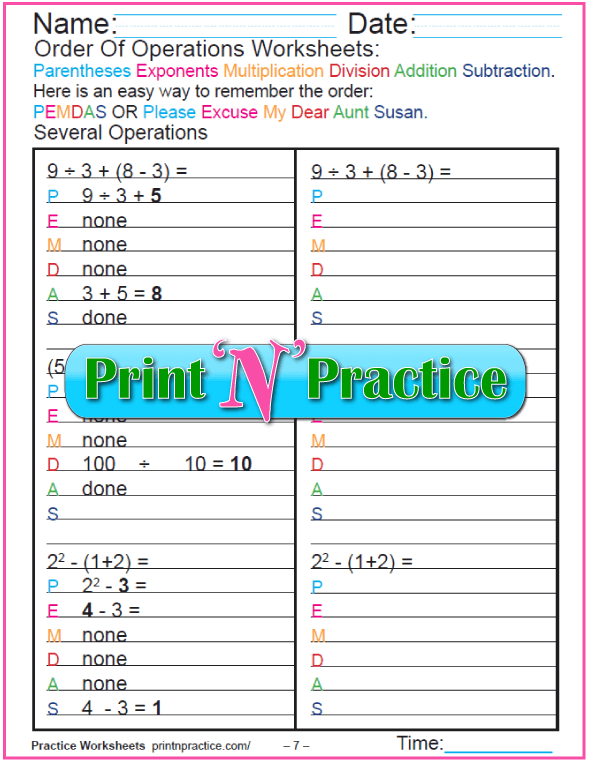 These order of operations worksheets teach it this way because the math books do and it's easy to remember. The phrase "Please excuse my dear Aunt Sara." is cute and short. 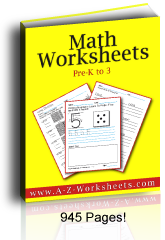 It works well with guided problem solving and you must use that formula if your Math textbooks use it, because you'll get a wrong answer if you don't. Memorization makes Math easier, so memorize that operations of equal priority should be worked left to right - usually. See what we found at Wikipedia below. "From the earliest use of mathematical notation multiplication took precedence over addition, whichever side of a number it appeared. Thus 3 + 4 × 5 = 4 × 5 + 3 = 23. When exponents were first introduced, in the 16th and 17th centuries, exponents took precedence over both addition and multiplication, and could be placed only as a superscript to the right of their base. Thus 3 + 5 2 = 28 and 3 × 5 2 = 75. 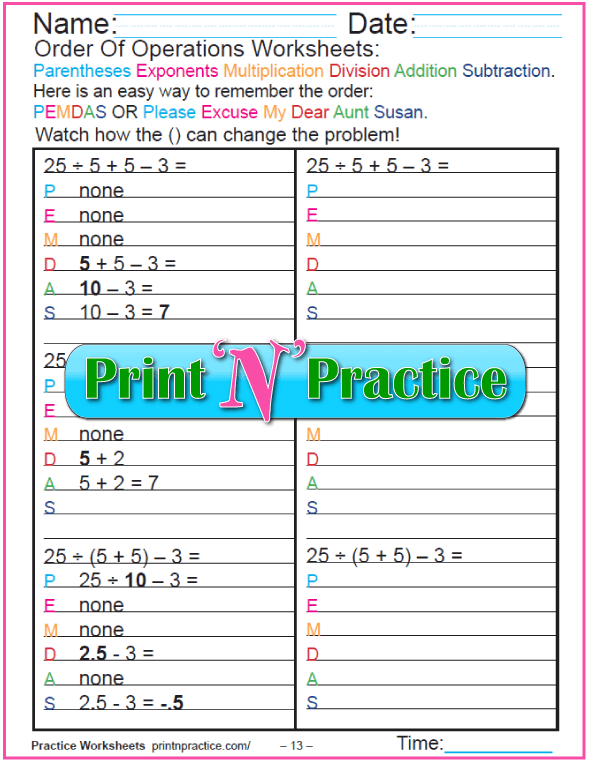 To change the order of operations, originally a vinculum (an overline or underline) was used. Today we use parentheses. Thus, to force addition to precede multiplication, write (2 + 3) × 4 = 20." Wikipedia points out that multiplication and division are of equal importance so that they can trade places. The same is true of addition and subtraction.
" 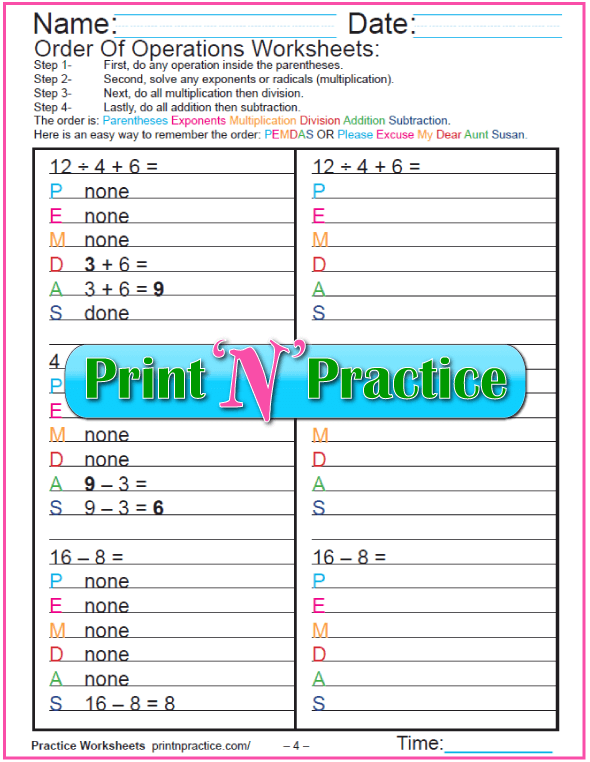 These mnemonics may be misleading, especially if the user is not aware that multiplication and division are of equal precedence, as are addition and subtraction. Using any of the above rules in the order "addition first, subtraction afterward" would give the wrong answer to many equations." If you figured the addition first the answer is 5. The order of operations really matters. This means that if a mathematical expression is preceded by one operator and followed by another, the operator higher on the list should be applied first. 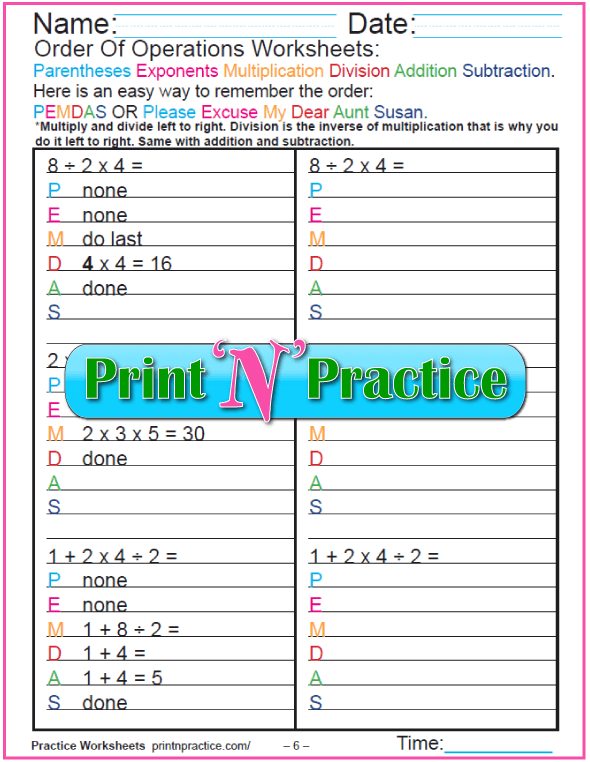 The commutative and associative laws of addition and multiplication allow terms to be added in any order and factors to be multiplied in any order, but mixed operations must obey the standard order of operations. It is helpful to treat division as multiplication by the reciprocal (multiplicative inverse) and subtraction as addition of the opposite (additive inverse). Thus 3/4 = 3 ÷ 4 = 3 • ¼; in other words the quotient of 3 and 4 equals the product of 3 and ¼. Also 3 − 4 = 3 + (−4); in other words the difference of 3 and 4 equals the sum of positive three and negative four. With this understanding, we can think of 1 - 2 + 3 as the sum of 1, negative 2, and 3, and add in any order: (1 - 2) + 3 = -1 + 3 = 2 and in reverse order (3 - 2) + 1 = 1 + 1 = 2. The important thing is to keep the negative sign with the 2. 2. Simplify Exponential powers and roots. 3. Multiply and Divide from left to right. 4. 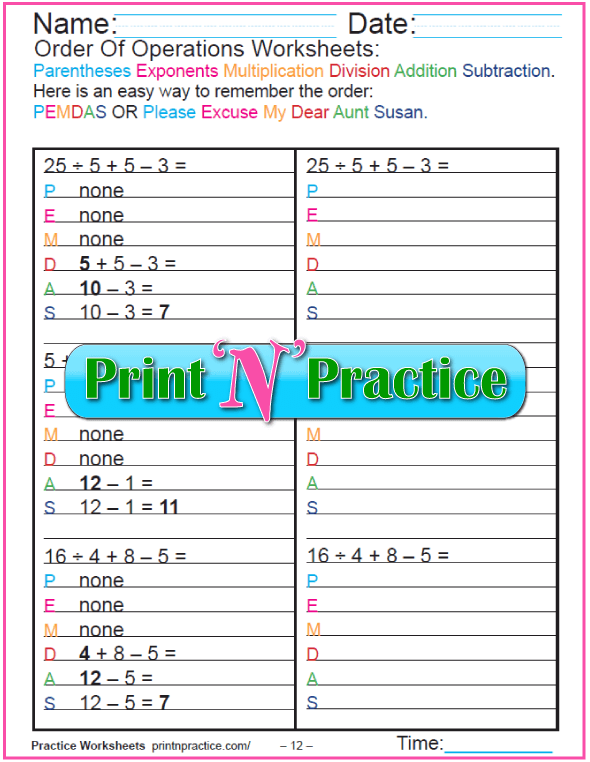 Add and Subtract from left to right. Thanks to Crewton Ramone and Teresa C for helping here! 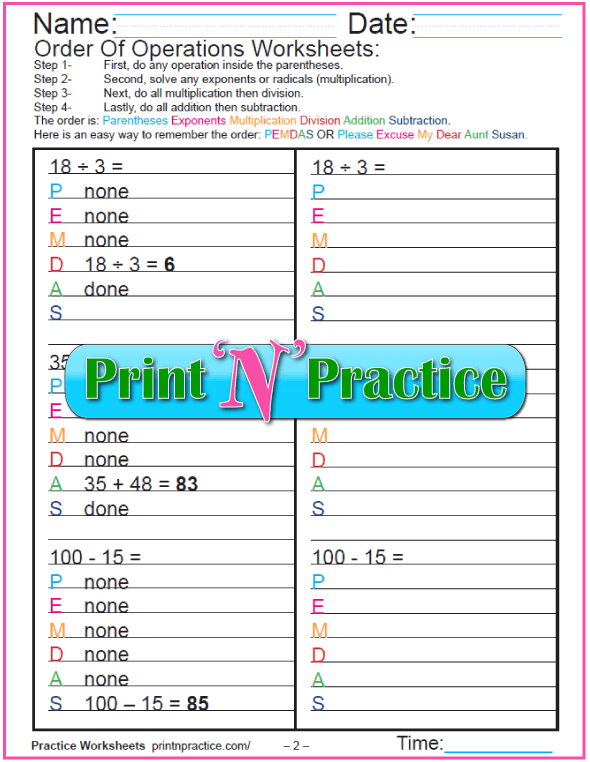 I made these printable Math exponent worksheets and charts to offer the practice necessary to become fast using exponents. 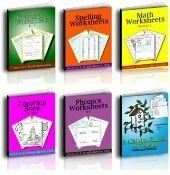 If your kids are not familiar enough with multiplication and division to tackle exponents, we have multiplication and division worksheets that are pure practice. Negative exponents mean the reciprocal of the base raised to the power of the exponent. 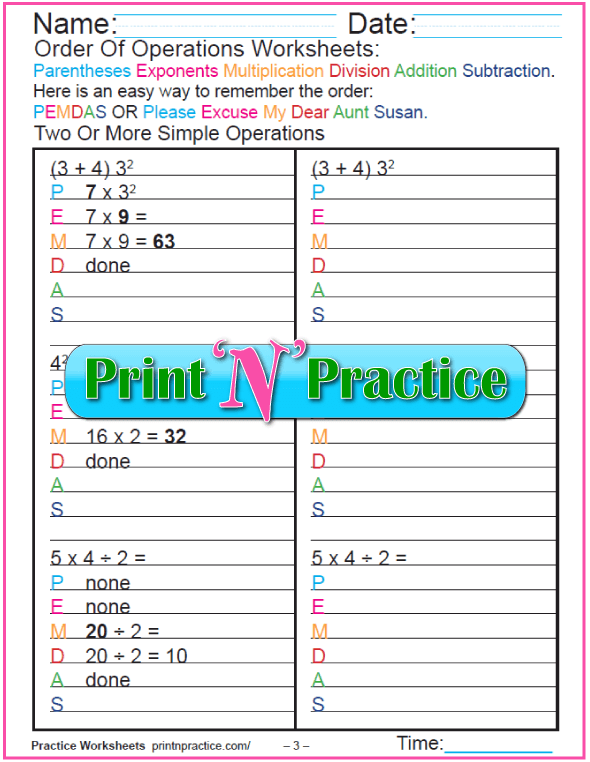 Thank you for visiting our Order of Operations worksheets.